Area: 308,642 sq. miles; slightly less than twice the size of California. Major cities: Capital: Maputo (pop. 1.6 million; 2011 est. ); Beira, Matola, Nampula, Quelimane, Tete, Nacala, Pemba. Nationality: Noun and adjective — Mozambican(s). Population (2011 est. ): 22.9 million; 48.2% male and 51.8% female. Annual population growth rate (2011): 2.4%. Ethnic groups: African 99.7% (Makhuwa, Tsonga, Makonde, Lomwe, Shangaan, Shona, Sena, Ndau, and other indigenous groups); remaining percentages include Europeans, Euro-Africans, and South Asians. Religions (2007 census): Christian 56%, Muslim 18%, indigenous African and other beliefs 26%. Education: Average years of schooling — male 10, female 8. Primary net enrollment rate (2005) — 78%. Adult illiteracy rate (2008) — 52.2%. Health: Infant mortality rate (2011): 79/1,000. Life expectancy (2011) — 52 years. Work force (9.9 million; 2010 est. ): By occupation (1997 estimate) — agriculture 81%; industry 6%; services 13%. Branches: Executive: President, Council of Ministers. Legislative — National Assembly, municipal assemblies. Judicial — Supreme Court, Appeal Court, provincial, district, and municipal courts. Administrative subdivisions: 11 provinces, 128 districts, and 43 municipalities, of which Maputo City is the largest. Political parties: Front for the Liberation of Mozambique (Frelimo); Mozambican National Resistance (Renamo); Democratic Movement of Mozambique (MDM); numerous small parties. Gross domestic product (GDP. 2010): $9.5 billion. Annual GDP growth rate (2010): 6.5%. GDP per capita (2010): $414. Agriculture (29% of GDP): Exports: cotton, cashews/nuts, prawns, sugarcane, tea, cassava (tapioca), corn, coconuts, sisal, citrus and tropical fruits, potatoes, sunflowers, beef, and poultry. Domestically consumed food crops — corn, pigeon peas, cassava, rice, beef, pork, chicken, and goat. Industry (27% of GDP): Types: food, beverages, chemicals (fertilizer, soap, paints), aluminum, petroleum products, coal, timber, natural gas, textiles, cement, glass, asbestos, and tobacco. Trade: Imports (2010): $3.8 billion. Import commodities — machinery and equipment, vehicles, fuel, chemicals, metal products, foodstuffs and textiles. Main suppliers — South Africa, Netherlands, Portugal. Exports (2011) — $2.3 billion. Export commodities — aluminum, cashews/nuts, prawns, cotton, sugar, citrus, timber, bulk electricity, natural gas. Main markets — Belgium, South Africa, Zimbabwe. During the colonial era, Christian missionaries were active in Mozambique, and many foreign clergy remain in the country. Under the colonial regime, educational opportunities for black Mozambicans were limited, and 93% of that population was illiterate. Most of today's political leaders were educated in missionary schools. After independence, the government placed a high priority on expanding education, which reduced the illiteracy rate to about two-thirds of the population, as primary school enrollment increased. In recent years, school construction and teacher training enrollments have not kept up with population growth. With post-war enrollments reaching all-time highs, the quality of education has suffered. By the early 20th century the Portuguese had shifted the administration of much of the country to large private companies, controlled and financed mostly by the British, which established railroad lines to neighboring countries and supplied cheap — often forced — African labor to the mines and plantations of the nearby British colonies and South Africa. Because policies were designed to benefit white settlers and the Portuguese homeland, little attention was paid to Mozambique's national integration, its economic infrastructure, or the skills of its population. From the mid-1970s, Mozambique's history reflected political developments elsewhere in the 20th century. Following the April 1974 coup in Lisbon, Portuguese colonialism collapsed. In Mozambique, the military decision to withdraw occurred within the context of a decade of armed anti-colonial struggle, initially led by American-educated Eduardo Mondlane, who was assassinated in 1969. When independence was achieved in 1975, the leaders of Frelimo's military campaign rapidly established a one-party state allied to the Soviet bloc and outlawed rival political activity. Frelimo eliminated political pluralism, religious educational institutions, and the role of traditional authorities. 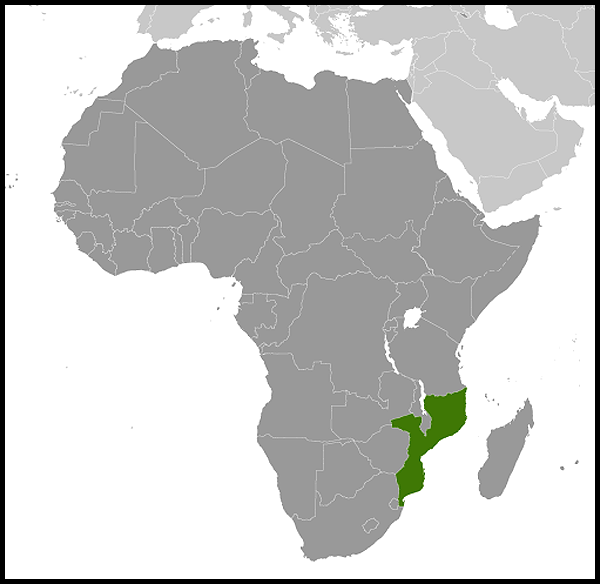 The new government gave shelter and support to South African (ANC) and Zimbabwean (ZANU) liberation movements while the governments of first Rhodesia and later apartheid South Africa fostered and financed an armed rebel movement in central Mozambique called the Mozambican National Resistance (Renamo). Civil war, sabotage from neighboring states, and economic collapse characterized the first decade of Mozambican independence. Also marking this period were the mass exodus of Portuguese nationals, weak infrastructure, nationalization, and economic mismanagement. During most of the civil war, the government was unable to exercise effective control outside of urban areas, many of which were cut off from the capital. An estimated 1 million Mozambicans perished during the civil war, 1.7 million took refuge in neighboring states, and several million more were internally displaced. In the third Frelimo party congress in 1983, President Samora Machel conceded the failure of socialism and the need for major political and economic reforms. He died, along with several advisers, in a 1986 plane crash which has been the subject of many conspiracy theories. A South African commission with an international membership and with access to the plane's black box found gross crew error to be the cause. Mozambique is a constitutional democracy with an estimated population of 23 million. The Front for the Liberation of Mozambique (Frelimo) has been the ruling political party since independence in 1975, heavily influencing both policymaking and implementation. While civilian authorities generally maintain effective control of the security forces, there have been some instances in which elements of the security forces acted independently. In 1994 the country held its first democratic elections. Joaquim Chissano was elected President with 53% of the vote, and a 250-member National Assembly was voted in with 129 Frelimo deputies, 112 Renamo deputies, and 9 representatives of three smaller parties that formed the Democratic Union (UD). By 1999, more than one-half (53%) of the legislation passed originated in the Assembly. The second general elections were held in December 1999, with high voter turnout. International and domestic observers agreed that the voting process was well organized and went smoothly. Both the opposition and observers subsequently cited flaws in the tabulation process that, had they not occurred, might have changed the outcome. In the end, however, international and domestic observers concluded that the close result of the vote reflected the will of the people. The third general elections occurred in December 2004. Frelimo candidate Armando Guebuza won with 64% of the popular vote. His opponent, Afonso Dhlakama of Renamo, received 32% of the popular vote. The estimated 44% turnout was well below the almost 70% turnout in the 1999 general elections. Frelimo won 160 seats in parliament. A coalition of Renamo and several small parties won the 90 remaining seats. Armando Guebuza was inaugurated as the President of Mozambique on February 2, 2005. Elections in Mozambique's 43 municipalities took place on November 19, 2008. Frelimo mayoral candidates won in 42 of the 43 contests. In October 2009, Mozambique held simultaneous presidential, legislative, and provincial assembly elections. The results were much the same as 2004 with Frelimo candidate Armando Guebuza winning 75% of the presidential vote and Afonso Dhlakama of Renamo coming in second with nearly 14%; Daviz Simango of the Democratic Movement of Mozambique (MDM) had 9.28% of the votes. Following parliamentary elections, Frelimo held 192 seats, Renamo 50, and MDM 8. Formed in early 2009 by incumbent Mayor of Beira and former Renamo rising star Daviz Simango, MDM represented the largest new face in the 2009 elections. Almost 2 months prior to election day, the National Elections Commission (CNE) released the list of eligible parties for the three races. Alleging missing registration documentation, CNE excluded multiple opposition parties, most notably MDM, from running in the National Assembly and provincial assembly electoral process. MDM, now excluded from 7 of 11 provinces due to CNE's decision, appealed to the Mozambican Constitutional Council, which in turn upheld CNE's ruling. Amidst rumors of Frelimo ties to both the Constitutional Council and CNE, the donor community voiced unified concern regarding the transparency of Mozambique's multi-party elections and continues to work with the Government of Mozambique to further electoral reform. Election day itself was considered well-run, peaceful, and generally well-organized, and most scrutiny was directed toward the pre-election decisions by the CNE and Constitutional Council. As a result of the irregularities in the election process, Freedom House removed Mozambique from its list of electoral democracies. Despite the government's strong anticorruption rhetoric, corruption in the executive and legislative branches was widely perceived to be endemic in 2009. The World Bank's Worldwide Governance Indicators reflected that corruption was a serious problem. Petty corruption by low-level government officials to supplement low incomes, and high-level corruption by a small group of politically and economically connected elites continued to be the norm. Corruption largely resulted from a lack of checks and balances, minimal accountability, and a culture of impunity. Local non-governmental organizations (NGOs), such as the Center for Public Integrity, and media groups continued to be the main civic forces fighting corruption, reporting and investigating numerous corruption cases. Mozambique ranked 116 out of 178 countries in Transparency International's 2010 Corruption Perception Index, up from a 2009 ranking of 130 out of 180 countries. The law requires that all members of the government declare and deposit their assets with the Constitutional Council, but does not require that such information be made available to the general public. Comprehensive anti-corruption legislation is currently pending parliamentary approval. Alleviating poverty. At the end of the civil war in 1992, Mozambique ranked among the poorest countries in the world. It still ranks among the least developed nations with very low socioeconomic indicators. In the last decade, however, Mozambique has experienced a notable economic recovery. Per capita GDP in 2010 was estimated at U.S. $414, up from the mid-1980s level of U.S. $120. With high foreign debt and a good track record on economic reform, Mozambique was the first African nation and sixth country worldwide to qualify for debt relief under the World Bank and International Monetary Fund (IMF) initial HIPC (Heavily Indebted Poor Countries) Initiative. In April 2000, Mozambique qualified for the Enhanced HIPC program and reached its completion point in September 2001. This led to the Paris Club members agreeing in November 2001 to substantially reduce the remaining bilateral debt, resulting in the complete forgiveness of a considerable volume of bilateral debt. The United States already finished the process and has forgiven Mozambique's debt. In July 2006, the World Bank announced it was writing off $1.3 billion, all Mozambican debt to the World Bank contracted before January 1, 2005, as part of the Multilateral Debt Relief Initiative (MDRI). In 2007, under MDRI, the IMF wrote off $153 million in Mozambican debt, and the African Development Bank wrote off $370 million. As a result of the debt relief it has received, the Government of Mozambique's outstanding debt stock has fallen to well below debt distress thresholds, according to the IMF. High growth. The resettlement of civil war refugees, political stability, and continuing economic reforms have led to a high economic growth rate. Between 1994 and 2006, average annual GDP growth was approximately 8%. Mozambique achieved this growth rate even though the devastating floods of 2000 slowed GDP growth to 2.1%. GDP growth rates hovered around 6%-7% from 2008 to 2010. Future strong expansion requires continued economic reforms, major foreign direct investment, and the resurrection of the agriculture, transportation, and tourism sectors. Focusing on economic growth in the agricultural sector is a major challenge for the government. Although more than 80% of the population engages in small-scale agriculture, the sector suffers from inadequate infrastructure, commercial networks, and investment. However, a majority of Mozambique's arable land is still uncultivated, leaving room for considerable growth. Some inflation concerns. The government's tight control of spending and the money supply, combined with financial sector reform, successfully reduced inflation from 70% in 1994 to less than 5% in 1998-1999. Economic disruptions resulting from the devastating floods of 2000 caused inflation to jump to 12.7% that year. Inflation ranged from 9%-11% in 2004-2006, but remained in the single digits in 2008-2009. As global food prices rose, inflation spiked to 13% in 2010. After September 2010 protests over high food prices, the government has pursued a policy of keeping its currency strong in efforts to keep the cost of living down for average Mozambicans. As of October 2011, the floating exchange rate was approximately 27 meticais per dollar, compared to 36 meticais per dollar in October 2010. Trade imbalance continues. In 2010, Mozambique exported $2.3 billion and imported $3.8 billion in goods, creating an overall trade deficit of $1.5 billion. Mozambique imported $223 million in goods from the U.S. in 2010, mainly cereal, machinery/equipment, petroleum oils, and petroleum coke. In 2010, Mozambique exported $64.7 million in goods to the United States, consisting of primarily agricultural products. Support programs provided by foreign donors and private financing of foreign direct investment mega-projects and their associated raw materials have largely compensated for balance-of-payment shortfalls. The medium-term outlook for exports is encouraging, as a number of recent foreign investment projects have improved the trade balance. This export growth is expected to continue. Traditional Mozambican exports include cashews, shrimp, fish, copra, sugar, cotton, tea, and citrus and exotic fruits. Most of these industries are being rehabilitated. In addition, Mozambique is less dependent upon imports for basic food and manufactured goods as the result of steady increases in local production. SADC trade protocol. In December 1999, the Mozambican Council of Ministers approved the Southern African Development Community (SADC) Trade Protocol. The Protocol envisions creating a free trade zone among more than 200 million consumers in the SADC region. Implementation of the Protocol began in 2002 and had an overall zero-tariff target set for 2008; however, Mozambique's country-specific zero-tariff goal is currently 2015. Mozambique joined the World Trade Organization (WTO) on August 26, 1995. In the years immediately following its independence, Mozambique benefited from considerable assistance from some western countries, notably the Scandinavians. Moscow and its allies, however, became Mozambique's primary economic, military, and political supporters and its foreign policy reflected this linkage. This began to change in 1983; in 1984, Mozambique joined the World Bank and International Monetary Fund. Western aid quickly replaced Soviet support, with the Scandinavians, the United States, the Netherlands, and the European Union becoming increasingly important sources of development assistance. Italy also maintains a profile in Mozambique as a result of its key role during the peace process. Relations with Portugal, the former colonial power, are complex and of some importance as Portuguese investors play a visible role in Mozambique's economy. Mozambique is a member of the Non-Aligned Movement and ranks among the moderate members of the African Bloc in the United Nations and other international organizations. Mozambique also belongs to the African Union (AU) and the Southern African Development Community (SADC). In 1994, the government became a full member of the Organization of the Islamic Conference (now the Organization of Islamic Cooperation), in part to broaden its base of international support but also to please the country's sizeable Muslim population. Similarly, in early 1996, Mozambique joined its Anglophone neighbors in the Commonwealth. In the same year, Mozambique became a founding member and the first President of the Community of Portuguese Language Countries (CPLP), and maintains close ties with other Lusophone states. The U.S. Embassy opened in Maputo on November 8, 1975, and the first American ambassador arrived in March 1976. In that same year, the United States extended a $10 million grant to the Government of Mozambique to help compensate for the economic costs of enforcing sanctions against Rhodesia. In 1977, however, largely motivated by concern about human rights violations, the U.S. Congress prohibited the provision of development aid to Mozambique without a presidential certification that such aid would be in the foreign policy interests of the United States. Relations hit a nadir in March 1981, when the Government of Mozambique expelled four members of the U.S. Embassy staff. In response, the United States suspended plans to provide development aid and to name a new ambassador to Mozambique. Relations between the two countries languished in a climate of stagnation and mutual suspicion. Contacts between the two countries continued in the early 1980s as part of the U.S. administration's conflict resolution efforts in the region. In late 1983, a new U.S. ambassador arrived in Maputo, and the first Mozambican envoy to the United States arrived in Washington, signaling a thaw in the bilateral relationship. The United States subsequently responded to Mozambique's economic reform and drift away from Moscow's embrace by initiating an aid program in 1984. President Samora Machel paid a symbolically important official working visit to the United States in 1985, where he met President Ronald Reagan. After that meeting, a full U.S. Agency for International Development (USAID) mission was established, and significant assistance for economic reform efforts began. The U.S. Embassy (http://maputo.usembassy.gov/) is located at 193 Avenida Kenneth Kaunda; P.O. Box 783; tel: (258-21) 49-27-97, after hours (258-21) 49-07-23; fax: (258-21) 49-01-14. USAID Mission: Av. 25 de Setembro (Predio JAT); tel: (258-21) 352-000, after hours (258-21) 49-16-77; fax: (258-21) 352-100. The Public Affairs Office/Martin Luther King Library: 542 Avenida Mao Tse Tung; tel: (258-21) 49-19-16; fax: (258-21) 49-19-18. Additionally, several hundred thousand mines were planted throughout Mozambique during 3 decades of conflict. Although mine clearing operations are underway, surface travel off main highways should be approached with caution.